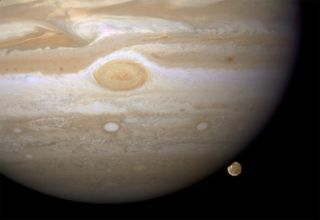 This photo, snapped by Hubble on April 9, 2007, shows Jupiter's moon Ganymede just before it ducks behind its giant host. NASA'sHubble Space Telescope has caught Jupiter's moon Ganymede playing a game of"peekaboo." The new image, released today, shows Ganymede just beforethe seemingly tiny orb ducks behind its giant host. Ganymedeorbits Jupiter every seven days. And since the moon's orbit is tilted nearlyedge-on to Earth, astronomers often spot Ganymede passing in front of anddisappearing behind Jupiter, only to reemerge later. Ganymede isthe largest of Jupiter's four moons called the Galileanmoons for their discoverer. In fact, this ball of rock and ice is thelargest moon in our solar system, with a diameter of about 3,270 miles (5,262km). Even so,the mega moon appears as a small marble next to Jupiter, the largest planet inthe solar system. Jupiter is so big that only part of its southern hemispherecan be seen in the Hubble image. Unlike thegas giant planet, Ganymede has a hard shell. The image shows features on Ganymede'ssurface, including the white impact crater called Tros and its system ofrays, bright streaks of material blasted from the crater. Tros and its raysystem are roughly the width of Arizona. The imagealso shows Jupiter's Great Red Spot (alarge eye-shaped feature at the image's upper left). A storm the size of twoEarths, the Great Red Spot has been raging for more than 300 years. In additionto wowing viewers, images like this provide astronomers with information aboutJupiter's upper atmosphere. That's because as Ganymede passes behind the giantplanet, it reflects sunlight, which then passes through Jupiter's atmosphere.Imprinted on that light is information about the gas giant's atmosphere, whichyields clues about the properties of Jupiter's high-altitude haze above thecloud tops. The newphoto is based on imagery recorded by Hubble on April 9, 2007. Hubble takes somany photographs of the cosmos that officials often process and release some ofthem long after the photos are actually captured. Hubbleimages arrive as ones and zeros representing grayscale, digital photos takenwith filters to block all but one color of light. The colorsare added later with the popular Photoshop program.